The Republic of France is located in Western Europe between the English Channel in the North, the Atlantic Ocean in the West and the Mediterranean in the South, and France includes the Island of Corsica. Paris is the capital of France and offers visitors an abundance of historic places of interest. France has a long and rich heritage that includes a long line of kings and queens that were overthrown in the French Revolution. Tourists to France will enjoy the wealth of historic places to visit that include Château de Versailles (Palace of Versailles), one of the most famous palaces in the world; Ch&acirc;teau de Fontainebleau - a favourite royal hunting lodge; Rambouillet - frequented by royalty and aristocrats until the late 19th century; Notre Dame (Cathedrale de Notre-Dame-de-Paris) - the world-famous French cathedral founded in the 12th century; Cathedrale de Chartres - famed for its stained-glass window, and the Hotel des Invalides - the magnificent 17th-century Parisian domed structure, constructed under the direction of Louis XIV (the Sun King). 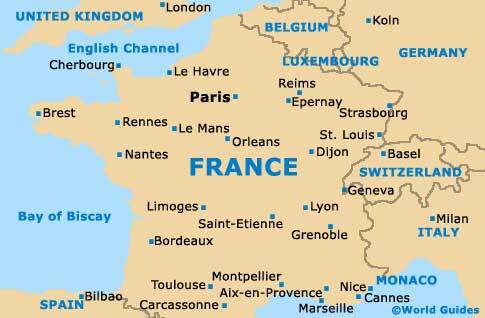 There are also numerous modern attractions to see in France including the Eiffel Tower - the breathtaking landmark that was built for the Universal Exhibition of 1889; family friendly Disneyland Paris Hotels - within the magnificent theme park; Monet's Water Garden in Giverny, and Parc Ast&eacute;rix - the exciting amusement / theme park. Other places of interest include Aires, Biarritz, Cannes, Chamonix, The Loire Valley, the Dordogne, Toulouse, Marseille and St. Tropez in the French Riviera. France has a wealth of accommodation to suit all travellers including budget lodging, travel lodges, bed and breakfast and luxury hotels. Places to visit in France are endless and there is something to suit everyone with theme parks, sporting venues, walking trails, museums, landmarks, monuments, festivals, carnivals, sandy beaches and quality shopping. France comes with a range of transport options, with the city of Paris featuring an extensive network of underground subway trains, named the 'Metro'. Car hire in France is ideal if you are planning to travel around the countryside and along the French Riviera coastline, although driving in central Paris is not recommended. Lying in the extremely scenic south-easterly area of France, Aix en Provence is brimming with traditional Parisian charm and comprises a number of stylish tree-lined boulevards. Locals often refer to the city of Aix en Provence as simply 'Aix'. A prominent coastal city known for its harbour, Bordeaux lies in south-western France and boasts a rather elegant persona. Bordeaux is filled with beautiful Neo-classical buildings and in recent years has undergone much renovation. Cannes may be widely associated with its glamorous film festival, but look beneath the glitz and you will discover a wonderful holiday destination. Located in sunny southern France, Cannes features many sandy beaches and marinas. The idyllic Mediterranean island of Corsica is rather like an entirely separate country to France and offers a very laid-back lifestyle. Ajaccio is the capital, while further places of interest include Bastia, Bonifacio, Calvi and Porto Vecchio. Le Mans is well known the world over for its legendary motor racing and this unique French city is the location of the famous 24-hour La Mans car race, held each summer in June. This event has become the pinnacle of motor sports in France. To many, Lyon is nothing short of the epitome of gastronomical France, being home to an outstanding cuisine and countless stylish bistros. Lyon is the capital of France's Rhone Alpes and visitors always enjoy strolling around its Old Town. Marseille is the second-largest city of all the French cities and is widely associated with its Mediterranean coastline and harbourfront. With a series of delightful districts, the golden beaches and corniches in Marseille are the main draw cards. The instantly recognisable island of Mont Saint Michel is to be found within the Normandy region of France. Almost resembling a fairytale castle, Mont Saint Michel has managed to retain much of its medieval character and is linked by a causeway. A tax-free haven located on the southern side of France, Monaco is actually a tiny country and home to a number of distinctive regions. Monte Carlo is the most visited of these and soon fills up each May, when the Monaco Grand Prix is held. An innovative city with an important university, Montpellier is both energetic and scenic. Many of the most appealing attractions in Montpellier reside within the historical district and around the city's extensive Mediterranean coastline. Nice, capital of the Cote d'Azur, is very much a cosmopolitan city and always extremely popular with visiting tourists. Part of the stunning French Riviera, Nice is the ideal holiday resort for lovers of the sun, sand, sea and water sports. Paris, France is one of the most fascinating cities in Europe, and visitors to this wonderful city will find that things to see and do are almost limitless. Known as the 'City of Light', the beauty of Paris is overwhelming and unrivalled. Since the 1960s, Saint Tropez has remained amongst the most popular beach resorts within southern France. Saint Tropez features a breathtaking setting alongside the French Riviera, with a number of sandy beaches and marinas. One of the treasures in south-western France, Toulouse has grown up around the banks of the winding River Garonne. Tourists visiting Toulouse always enjoy the beautiful historic buildings within the city's Old Quarter (Vieux Quartier). Lying just a few miles to the south-west of central Paris, Versailles may be a small city, but is home to one of the world's biggest palaces. The Palace of Versailles is nothing short of magnificent and comprises some 700 different rooms.